Julie Garza es una de las locutoras más reconocidas y queridas por la comunidad hispana del estado de Carolina del Norte. La programadora y locutora de La Ley 101.1FM cuenta con mas de 20 años de experiencia. Comenzó su carrera en radio en Austin, Texas como locutora de un programa de Rock en Español. Gracias a su carisma y encanto fue abriéndose paso en un campo dominado por hombres convirtiéndose así en una de 20 mujeres programadoras de radio a nivel nacional. A lo largo de su carrera, Garza ha recibido numerosos reconocimientos incluyendo Latin American Women’s Club 2008, Monitor Latino Programadora del Año 2009 y Monitor Latino Locutora del Año 2009. También ha sido nominada por Monitor Latino como Programadora del Año en el 2011 y 2012. Y en el 2017 gano el prestigioso premio, Medallas de Cortez. Ha entrevistado a varias de las figuras del medio artístico más importantes del momento como Ana Barbara, Espinoza Paz, Sebastian Rulli, Juanes, Paulina Rubio Domenic Marte, Horoscopos de Durango, Alex Lora, y La Banda el Recodo entre muchos más. Garza ha sido invitada a participar en conferencias como Billboards Regional Music Conference, Convención Monitor Latino, y en la conferencia Radio and Records en su ultima edicion. Ella tambien fue entrevistada para el programa Aqui y Ahora de Univision para hablar de la popularidad de la musica Regional Mexicana. En el 2012, fue juez invitado, durante una semana, para el reality show de Azteca America, Quiero Ser Grupero. Desde febrero del 2012 es propietaria de una compañía de entretenimiento, Julie Garza Entertainment en donde organiza y ameniza diferentes tipo de eventos sociales. Su creatividad y dinámica le permiten contagiar de alegría, ilusión, entusiasmo e inspiración a sus audiencias en cada evento. Garza es graduada con una licenciatura en Radio-TV-Cine de la University of Texas en Austin. Ella nació en Brownsville, Texas (frontera con Tamaulipas) y actualmente reside en Raleigh, NC junto a su esposo y mama. 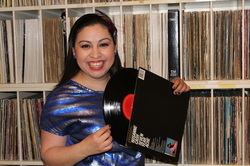 Curtis Media’s WYMY (La Ley) in Greensboro, North Carolina, has three finalists for Radio Ink’s prestigious Medallas de Cortez awards: for Local Personality, Eric Johnson & DJ Gallo, for Sales Manager Shirley Davenport, and Program Director Julie Garza (pictured). The station has been carrying the Regional Mexican format in the Triangle market for 14 years and is killing it in Greensboro.Garza has been with Curtis for 12 years and for all 12 of those years she’s been the PD for WYMY. She’s a big part of why WYMY sounds as strong as any major market station. Radio Ink: Why do you believe the format is working in that part of North Carolina? Julie Garza: As we know, the majority of the immigrant community and the largest minority in the US is Mexican. Therefore, the format fits the potential audience in this market. North Carolina has grown tremendously and we have had continued growth of Hispanics that support the format. Plus, we are committed to being an entertainment and information resource for our audience. We are live and local and that has been a great asset to our success. We don’t carry syndicated shows because, as a growing market, we still think the best for us is live and local. Radio Ink: Tell us what WYMY means to the local community? Julie Garza: We strive to be a source of information that is trustworthy. Many people have described it as community plaza/town hall. We frequently interview community leaders, agencies that provide aid, and others. We get phone calls many times asking if X scenario is true. People will ask if we know if it’s true that police are conducting raids, or if the school district is going to close because of weather, so this is how we know that we have the continued responsibility to provide accurate information to our listeners. And that can only happen with local radio. Radio Ink:What is the key to your talent connecting with the listeners? Julie Garza: I think we are genuine. People get to know about us, our family, our hobbies, we are transparent and that is very much appreciated by our audience. It builds that relationship with them. Radio Ink: What role does social media play at WYMY and how are you using it? Julie Garza: We are using social media more and more each day. As the technology evolves we continue to evolve and learn how to best make it useful for our station and our audience. We use Facebook most for informing our audience, and the Facebook Live component has been great to share when we are at events, at remotes, and even in the studio. Twitter is not as strong with our audience, but Instagram is. Instagram is especially good for our younger listeners and we try to engage them with good pictures and contesting. Radio Ink: Tell us about one or two home run promotions/events you’ve pulled off in the past year. Julie Garza: We have a yearly promotion that is giving away “Benjamins” and people get really excited. We basically tell listeners to go online and register, then they have to listen at 7:35 because we will announce the times the Benjamins will be given away. (Benjamins are $100 bills/check). So then at the designated time we call out a name and then they have 10 minutes to call us back. If they do, then they win $100. It has been very successful, we see meters increase at 7:35 tremendously. And then we see people start calling even before we call the name in anticipation of their name being called. It’s pretty awesome. Another event we hold is The Battle of the Bands — local bands sign up to participate and then we hold an outdoor festival where families come and support their favorite band. We invite artist judges, and at the end of the night we crown a winner. Again, this is another way to support and connect with our community. Radio Ink: What do you focus on to make WYMY the greatest-sounding station it can be? Julie Garza: I think our focus is always on the listener. We ask ourselves, are we playing the best music for the listener? Are we talking about relevant topics? Are we tasteful in our jokes and humor? We try to listen to them at events and remotes to learn what they need or enjoy and try to include it in our programming. We try to reinvent ourselves and I ask talent to always be truthful and think about the listener. It’s not about us, it’s about them. Radio Ink: If you could give a young programmer advice, someone in this format, what would you say to them? Julie Garza: I would say you need to know your market. Each market is different. Even though I’ve always worked in Regional Mexican, each station has had differences. So, know what the market wants and needs and fulfill that. Be honest, be your best, ask for advice, don’t be afraid to fail, and give people a chance.